The apple can be traced back to the Romans & Egyptians who introduced them to Britain & finally to America. Today, Americans eat about 120 apples apiece each year. At least 50% of the domestic crop is used in items we use every day such as, applesauce, juice, jellies, pies & other popular desserts. (Wellness Encyclopedia of Food and Nutrition, 1992). Choose apples that are firm with no soft spots. Avoid apples that are discolored for their variety. Keep apples in plastic bags in the refrigerator after purchasing to prevent further ripening. Apples should keep up to 6 weeks. However, check apples often & remove any apples that begin to decay or the others will do the same. Wash apples well with soap & rinse with water. Prepare apple dishes just before serving to minimize browning (oxidation). Protect cut apples from oxidation by dipping them into a solution of one part citrus juice & 3 parts water. There are about 2500 known varieties grown in the US. 36 states grow them commercially with the following as top producers, WA, NY, MI, CA, PA, & VA. 56%of the 1999 crop was eaten as fresh fruit & 42% was processed. In depth information about varieties & recipes to use apples: click here! In Latin, apricot means "precious," a label earned because it ripens earlier than other summer fruits. A relative of the peach, the apricot is smaller & has a smooth, oval pit that falls out easily when the fruit is halved. Apricots originally came from China. This golden fruit has been around for more than 4,000 years. Apricots progressively made their way thru the Persian Empire to the Mediterranean where they were fondly adopted. Spanish explorers introduced the apricot to the New World & they were planted in the gardens of Spanish missions all over California. The first recorded major production of apricots in America was in 1792 south of San Francisco. Excellent source of vitamins A & C.
What it's good for: Promotes growth & repair of body tissue, healthy eyes, good night vision & a strong immune system. Where you get it: Liver & fish oils, whole & fortified milk & eggs. Carrots, sweet potatoes, spinach & other leafy green veggies, yellow squash, peaches & apricots provide Beta & other carotenes. RDA: 800 RE for adult women; 1,000 RE for adult men. Watch out: Vitamin A can be toxic in large doses & when taken during pregnancy can cause birth defects. Your body stores excess vitamin A so don't exceed the RDA. Should be deep yellow with pink blush: no sign of green. Plump & firm with tender, velvety skin. Store at room temperature or refrigerate. Use within a day or two. Poach underripe fruit in sugar & water to soften & bring out the flavor. Raw (best at room temperature): salads, sorbets & out of hand. Cooked: jams & tarts. Good with meats such as turkey. In the United States, 95% of apricots grow in the San Joaquin Valley & other parts of northern California. More than 400 growers produce many varieties of apricots, the most common of which are featured in the table below. Growers continually experiment with new varieties that deliver sweet flavor & ship or process well. Apricots will ripen at room temperature. To help them ripen, place them in a paper bag with an apple. When they yield to gentle pressure, they're ready to eat. Refrigerate ripe apricots, unwashed, in a paper or plastic bag up to 2 days. Wash them before eating. They're a perfect fast food anytime. To cut fruit, slice around its seam, twist it in half & lift out the pit. Broiling or grilling: Try threading the apricots (whole or halved) on skewers. Brush them with a little honey & grill until semi-soft. Broiling apricots is easy. Simply halve the apricots, place them on a cookie sheet with the skin down & the cut side up & heat for 7 to 10 minutes. Poaching: It’s a great method for making a delicious sauce. Simply place the apricots with their skins intact into simmering water or fruit juice & cook until tender. Adding spices such as cinnamon or cloves enhances the apricot taste. When the apricots are tender, the poaching liquid can be used as a sauce. Poaching takes about 6 to 8 minutes. The nutrients (e.g., beta-carotene & niacin) are more concentrated in dried than in fresh apricots. Dried apricots also have a higher sugar content, which makes them more likely to stick on your teeth. Your dentist will remind you to brush or rinse your teeth after eating any dried fruit or sticky foods. If you’re allergic or sensitive to sulfites, remember to look on the label of the package to see if the apricots were treated with sulfur dioxide for color preservation. Look in health-food stores for apricots that weren't treated with sulfites. They’ll be brown, not orange. click here for apricot recipes! Avocados were first cultivated in South America with later migration to Mexico. It was believed that a Mayan princess ate the very first avocado & that it held mystical & magical powers. European sailors traveling to the New World used avocados as their form of butter. Avocados were first seen in the United States in the early 1800's. California is currently the largest producer of avocados stateside. There are more than 80 varieties, with the "Hass" variety dominating the crop share. A single mature avocado tree can produce more than 400 pieces of fruit in a year. Avocados are loaded with nutrients such as dietary fiber, vitamin B6, vitamin C, vitamin E, potassium, magnesium & folate. They're also cholesterol & sodium free. Avocados contain 60% more potassium per ounce than bananas. This fruit is an excellent source of monounsaturated fat. Look for firm avocados if you're planning on using them later in the week, otherwise, select fruit that yields to gentle pressure for immediate use. Color alone will not tell you if the avocado is ripe. Ripe fruit will be slightly firm, but will yield to gentle pressure. To speed the ripening process, place the avocado in a paper bag & store at room temperature until ready to eat (usually 2 to 5 days). Placing an apple together with the avocado speeds up the process even more. Cut the avocado in half, slightly twist the two halves, separate, & remove the seed. Starting at the small end & remove the skin with a knife, or, if you prefer, you can also scoop the flesh out with a spoon. To retain a fresh green color, avocados should either be eaten immediately or should be sprinkled with lemon or lime juice or white vinegar. There are several varieties of avocados & each have a unique flavor & texture. Here are some of the most common avocado varieties in the United States. click here for more in depth variety info & recipes! Bananas are the most popular fresh fruit in the US. They have a peel that comes off easily, they ripen after they've been picked, there is a generous supply all year & they're inexpensive. Bananas have both a high amount of carbohydrates as well as potassium, which also makes them the fruit of choice for many athletes. (Wellness Encyclopedia of Food and Nutrition, 1992). Avoid bananas with brown spots that seem very soft. Select those bananas with a nice color, specific for the variety. Choose fruit that's firm & free of bruises. Best eating quality has been reached when the solid yellow skin color is speckled with brown. Bananas with green tips or with practically no yellow color haven't developed their full flavor. Bananas are overripe when they have a strong odor. To further ripen bananas leave at room temperature for a couple of days. Once ripe you can store in the refrigerator for 3 to 5 days. The peel may turn brown in the refrigerator, but the fruit will not change. The very popular yellow banana of Cavendish is the banana we see in grocery stores. However, Plantains, Finger Bananas & Red Bananas are also popular varieties. Most have a soft texture when ripe. for banana recipes, click here! One of the nation’s most well liked fruits; berries have origins in both Europe & here in the US. The Native Americans were the first to incorporate berries into their diets & lifestyle. Today, berries are appreciated worldwide. Berries signify summer & rightfully so, as the warmer months are the peak harvest for these fruits. Berries have traditionally included blueberries, strawberries, raspberries & blackberries. However, there are other varieties that have since flooded the markets. Many berries are suitable to eat raw & most types vary from 50 to 100 calories per serving if eaten raw. Berries are brimming with vitamin C, potassium & fiber. Berries should be firm, plump, and fully colored. Store at room temperature or refrigerate in a single layer. Use within a day or two. Wash when ready to use. Raw: fresh fruit desserts, salads, and smoothies. Cooked: cobblers, crisps, jams, muffins and pies. Pterostilbene is a stilbenoid chemically related to resveratrol. It's thought to be the key compound found predominantly in blueberries (as well as grapes) that exhibit anti-cancer, anti-hypercholesterolemia, anti-hypertriglyceridemia properties, as well as fight off & reverse cognitive decline. It's believed that the compound also has anti-diabetic properties, but so far very little has been studied on this issue. Additionally, it's also touted as a potent anti-fungal. Packed with health-promoting phytochemicals, Wild Blueberries have the power to keep you healthy, a little something we like to call the Power of Blue. Though small in size, the Wild Ones are packed with antioxidants that may help your body fight everything from the effects of aging to vision problems to cancer. What's more, eating deep-blue Wild Blueberries every day is a great way to get one of your recommended 5 A Day servings of colorful fruits & vegetables. read more about blueberries by clicking on the following links! It's nice to know that something that tastes so good is so good for you. Blueberries may help the body fight aging, cancer & heart disease & improve vision. What gives them their lovely indigo color is actually a powerful antioxidant called anthocyanin. Blueberries grow wild in Scandinavia, the British Isles, Russia & North & South America. Surprisingly, blueberries weren't grown on farms until the early 1900's. Cultivated berries are larger than their wild cousins. But all blueberries have that beloved sweet, juicy taste. Blueberries are a great source of vitamin C and a good source of fiber. A cup of blueberries has a mere 80 calories. Some scientists say you should eat blueberries every day you can. They're one of the richest sources of antioxidants of all fresh fruits & vegetables. Look for dark blue fruit that have a silvery cast. Also, choose berries that are plump, firm, the same size, dry & free of stems or leaves. Avoid soft, mushy, or moldy berries or juice-stained containers. Blueberries won't ripen after you buy them, so plan to eat them within a couple of days. Handle the fragile fruit tenderly; wash just before eating. To enjoy blueberries year round, try freezing them. Scatter a single layer of unwashed, fresh berries on a cookie tray. Once they're frozen, transfer the blueberries to an airtight plastic bag or container. Remember to wash before using. Blueberries are delicious by the handful. Popping the sweet, button-like fruit into your mouth is one of summer's pleasures. They're dynamite paired with sliced peaches or strawberries. Blueberries are also great sprinkled over cereal, or yogurt, or low-fat ice cream. If you're baking, a squeeze of lemon enhances the fruit's flavor. Blueberries are a natural in cobblers, crisps, jams, muffins, and pies. They also pair well with poultry — try blueberries in your next chicken salad (substitute yogurt for mayo). Excellent source of vitamin C. Good source of fiber. Select berries with a good red color & an intact green, leafy hull. Avoid berries with soft or brown spots. Huge berries often have hollow centers & little flavor or juice. Store at room temperature or refrigerate in a single layer. Use within a day or two. Wash before removing green tops & only when ready to use. Raw: fruit tarts, salads, smoothies & sorbets. In general, berries should be dry, firm, well shaped, and eaten within a week after purchase. If you can’t eat them that soon, remember that berries freeze well! It’s best to buy berries that are ‘in-season’ as they’ll cost less and are more ripe and flavorful than ‘out-of-season’ berries. Select blueberries that are firm, dry, plump, and smooth-skinned. Berries should be deep-purple blue to blue-black; reddish berries aren't ripe but can be used in cooking. Select raspberries and blackberries that are unblemished dry, in an unstained container. Raspberries should be medium to bright red, depending on the variety. Blackberries should be shiny and black — avoid those that are dull or reddish. Moisture will increase spoilage, so the berries themselves should be relatively dry. Shelf life for raspberries and blackberries is short, and they should be consumed within 2–3 days of purchase. Eat at room temperature for fullest flavor. Currants should still be firmly attached to their stems. After purchasing berries, check the fruit and toss out any moldy or deformed berries. Immediately eat the overripe berries within 24 hours. Return the other berries back to the original container or they should be arranged unwashed in a shallow pan lined with paper towels, and washed just prior to use. The berries may be topped with a paper towel to absorb any additional moisture. Plastic wrap the entire container. This will ensure the fruit retains its freshness, but generally berries should be eaten within one week. Because berries have a short shelf life, an alternative to enjoy them year round is to buy them fresh and freeze them yourself. The secret to successful freezing is to use unwashed and completely dry berries before placing them in a single layer on a cookie sheet in the freezer. Once the berries are frozen, transfer them to plastic bags or freezer containers. Frozen berries should last approximately ten months to one year. When you’re ready to use the berries, go through the lot once more to sort out any undesirable fruit. Then, rinse, drain, and pat dry the fruit. Commercially frozen berries do not need to be ‘cleaned’ or thawed. If you froze your own berries, a quick rinse may be necessary. When making pancakes and waffles, add the blueberries as soon as the batter has been poured on the griddle or waffle iron. This will make the pancakes prettier and they'll be easier to flip. If frozen blueberries are used, cooking time may have to be increased to be sure the berries are heated through. Frozen raspberries and blackberries are available in grocery stores. Blackberries are available in 16 oz. poly bags, while raspberries are available in 12 oz. poly bags. A 12 oz. bag of whole frozen raspberries is equal to about 3 cups frozen berries. Cherries are drupes, or stone fruits, related to plums & more distantly to peaches & nectarines. They've been enjoyed since the Stone Age-pits were found in several Stone Age caves in Europe. The Romans carried cherries throughout Europe & England along the routes of conquest. Cherries are grown in several regions of this country, but 70% of the cherries produced in the US come from four states (Washington, Oregon, Idaho & Utah). There are two main types of cherries: sweet & sour. Sour cherries are lower in calories & higher in vitamin C & beta carotene than sweet cherries. This variety is the best known sour cherry. It's mostly canned or frozen for use as pie filling or sauce. They're grown mostly in the eastern & Midwestern states. This variety is the best known sweet cherry. It's large, round, extra-sweet & has a purple-red flesh & a deep red skin that's close to black when fully ripe. The Bing is available from the end of May until early August. This variety is the second most popular sweet cherry. It's smaller than the Bing & is more heart shaped. It has a dark-red skin & a rich flavor. Lamberts are available a bit longer than the Bing, usually until the end of August. This variety is sweet with a yellow or pinkish skin. It's milder & sweeter than the Bing. However, this variety is grown in limited quantities. This variety has a blush-yellow skin & is often canned or made into maraschino cherries. Buy cherries that have been kept cool & moist, as flavor & texture both suffer at warm temperatures. Cherries have a limited growing season & any fresh cherries grown in the US sold after August probably came from cold storage. Small quantities of sweet cherries are imported from New Zealand during the winter months, but these may be difficult to find. At the market, pick a handful of cherries at a time & only select the best fruit. This may be time-consuming, but the reward will be better cherries. Good cherries should be large (one inch or more in diameter), glossy, plump, hard & dark-colored for their variety. Buy cherries with stems on - they should be fresh & green. Reject undersized cherries or those that are soft or flabby. Avoid fruit that is bruised or has cuts on the dark surface. If you find many damaged fruits at the market, consider buying cherries somewhere else, as a number of spoiled cherries will start the others to decay. Loosely pack unwashed cherries in plastic bags or pour them into a shallow pan in a single layer & cover with plastic wrap to minimize bruising. Store cherries in the refrigerator & cherries in good condition should last up to a week. Check the fruit occasionally & remove the cherries that have gone bad. Wash the fruit before eating. You can freeze cherries by rinsing & draining thoroughly, spreading them out in a single layer on a cookie sheet & placing in the freezer overnight. Once the cherries are frozen, transfer them to a heavy plastic bag. The frozen fruit may be kept up to a year. Most cherries bought at the market are eaten raw, alone or accompanied by other fruits. Simply wash the fruit & serve with the stems. For cooking, pit cherries either by hand or with a pitter. Poaching is the most common form of preparation. Drop cherries into a small amount of simmering water, or a combination of water & wine & cook for 1 to 3 minutes until soft. Poach using the formula of 1 cup liquid to 2 cups cherries. Native Americans used cranberries for both their medicinal and natural preservative powers. They brewed cranberry mixtures to draw poison from arrow wounds. They also pounded cranberries into a paste and mixed the paste with dried meat to extend the life of the meat. The name cranberry was given to this plant because the Pilgrims believed the plant looked like the head of a sandhill crane and was originally named ‘craneberry.’ Over time, the ‘e’ was dropped. Good, ripe cranberries will bounce, which is why they are nicknamed ‘bounceberries.’ They should be shiny and plump and range in color from bright light red to dark red. Shriveled berries or those with brown spots should be avoided. Cranberries do not ripen after harvest..
Cranberries are often too tart to be eaten raw. Most cranberries need be cooked before they are eaten. No matter what preparation method you choose, cook cranberries only until they pop because overcooking gives them a bitter taste. Since cranberries are almost 90% water, do not thaw frozen cranberries before cooking them. Thawing, will cause the fruit to breakdown, resulting in soft cranberries. Cranberries may be baked with a sweetener to make a topping or sauce, or they can be added to baked goods, such as muffins. They are also good chopped with oranges to make a relish. There are four major varieties of cranberries: European, American, Mountain, and Highbush. This variety is the most common in the United States. The U.S. Department of Agriculture uses this variety as the standard for fresh cranberries and cranberries used for juice. This variety is bright red. This variety is smaller than the American and is eaten less often than other varieties. It is primarily ornamental. This variety is approximately ¼ to ½ inch in diameter and is bright red to dark red. It is occasionally found in markets. This variety is primarily used for jellies, jams, and sauces. It is also used as an ornamental fruit. The grape is one of the oldest fruits to be cultivated going back as far as biblical times. Spanish explorers introduced the fruit to America approximately 300 years ago. Some of the most popular ways in which the fruit is used, is eaten fresh, in preserves or canned in jellies, dried into raisins, and crushed for juice or wine. Although, machines have taken the place of much handwork, table grapes are still harvested by hand in many places. (Wellness Encyclopedia of Food and Nutrition, 1992). Grapes come in more than 50 varieties in black, blue, blue-black, golden, red, green, purple, and white colors with a juicy pulp inside. The two main types of grapes are the American and European. They both come in seeded and seedless varieties. Common varieties include Thompson, Flame, Ruby, Perlette and Tokay grapes. Most U.S. grapes are grown in California. Look for firm, plump, well-colored clusters of grapes that are securely attached to their green stems. Fully ripe grapes are soft and tender. Grapes showing signs of decay, shriveling, stickiness, brown spots or dry brittle stems should be avoided. Blue Concord grapes are excellent for table use and for making juice and jelly. The large, purplish-red catawba variety is used primarily for making juice and wine, but can also be served fresh for eating. Fresh grapes maintain good quality for two to three days in the refrigerator. Store in a covered container or plastic bag. Table grapes are at their best served slightly chilled to enhance their crisp texture and refreshing flavor. Grapes are easier to peel when they're frozen. Just rinse frozen grapes in lukewarm water until skins split. Skins will then slip right off. For longer storage, grapes can be canned, frozen or made into juice or sweet spreads to enhance meals throughout the year. Grapes can be dried as raisins for use as a snack or in baking. To prevent mold growth, seal grape jelly with two-piece canning lids and process for five minutes in a simmering water bath. Frozen grape juice is of excellent quality—serve it alone or mixed with other juices. Freeze a few grape "popsicles" for an icy summer treat. Freeze grape puree for use in making grape pie and to flavor yogurt. Tray freeze seedless grapes and store them in freezer containers. When summer temperatures sizzle, chill summer drinks with "grape" ice cubes. For an easy, refreshing summer dessert, serve tray frozen grapes in a chilled glass bowl. The quality of dried grapes, or raisins, is excellent. For best results, use seedless grapes. If seeded varieties are used, remove seeds as described under Fresh Facts before drying. In areas of high humidity, sun drying is not recommended. For best results, dry grapes in a dehydrator or oven. The grapefruit we know today was developed in the West Indies in the early 1700s and first introduced to Florida in the 1820s. Today, most grapefruit is still grown in Florida. Since the early part of the 20th century, mutant strains of white grapefruit have appeared with pink to slightly reddish color, and have been propagated by citriculturists into several strains of grapefruit that are now best known as the Ruby Red. Grapefruit got its name from the way it grows in clusters (like grapes) on the tree. There is no mistaking a grapefruit tree—they are large with glossy dark green leaves and the fruit hangs in clusters on the tree. Grapefruit trees are beautiful and a member of the citrus family. It seems to be a cross between an orange and a shaddock, combining the sweet and tangy flavor of each fruit. A cold glass of grapefruit juice is part of the morning routine for a lot of people. What you may not realize, however, is that this same juice might interact with drugs you are taking. The interaction between grapefruit and some medications was discovered by accident when researchers were looking for an interaction between a particular blood pressure medicine and alcohol. Grapefruit juice was used as a vehicle to mask the taste of the alcohol. While the alcohol did not affect the amount of the drug circulating in the body, the grapefruit juice greatly increased the levels of the medication. Some medications which may be affected by grapefruit juice include: midazolam (Versed¾), cyclosporin (Sandimmune¾, Neoral¾), lovastatin (Mevacor¾), simvastatin (Zocor¾), ¾), pravastatin (Pravachol¾), and Thyroid medications. Certain prescription antihistamines, such as Astemizole which is in Hismanal¾ and terfenadine which is in Seldane¾ and Seldane-D¾, could also be affected by grapefruit juice. With these particular medications, increased drug levels could be associated with arrhythmias which could be fatal. If you are taking a medication that should not be taken with one of these drugs, Erythromycin, itraconazole (Sporanox¾), ketoconazole (Nizoral¾), mibefradil or (Posicor¾), the safest course of action is to assume that it would interact with grapefruit juice. An example of this is cisapride (Propulsid¾), which is used to treat certain gastrointestinal problems. If you drink grapefruit juice regularly, it would be a good idea to inquire about its possible interaction with any medications you may be taking or any new drugs that are added. Some sources recommend not drinking grapefruit juice within 2 hours before and 5 hours after a drug that may interact with it. A safer approach would be to substitute another citrus juice, such as orange juice, which has the same vitamins but has not demonstrated the drug interactions. Remember that eating grapefruit or taking grapefruit supplements may also interact with the same medications. Some drinks that are flavored with fruit juice could be flavored with grapefruit juice. Check the label, if you are not sure. There are three major types of grapefruit white, pink/red, and star ruby/rio red varieties. All grapefruit have a similar tangy-sweet flavor and are very juicy. The grapefruits that are used to make juice are those which contain seeds. The pink or red variety contains more vitamins than the white. Choose grapefruit that is glossy, round, smooth and heavy for its size. Avoid any grapefruit with brown and/or soft spots. Store grapefruit at room temperature up to a week, or up to 8 weeks in a refrigerator. Leave at room temperature for a couple of hours before eating. Did you know that kiwifruit is more than 700 years old? Kiwifruit history began in the Yang-tse river valley in China, where it was called "Yangtao." The Yangtao was considered a delicacy by the court of the great Khans who cherished its delicious flavor and emerald-green color. The small, brown, fuzzy "Yangtao" fruit grew wild on vines that wrapped around trees. Between 1800 and 1900 knowledge of the fruit spread to other countries, and samples of the fruit and seeds were sent to England. In 1904 plant cuttings were brought to the United States (1999 Produce Availability and Merchandising Guide, The Packer. 1999). Seeds were sent to New Zealand in 1906, and the fruit was renamed the "Chinese Gooseberry" (Wellness Encyclopedia of Food and Nutrition, 1992). New Zealand's "Chinese Gooseberry" variety was first shipped to the United States in 1962, where it was re-named Kiwifruit after New Zealand's national bird the "kiwi." In the 1970s it was grown in California and available for the first time in supermarkets throughout the United States. 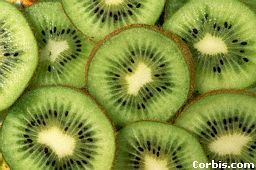 Most kiwifruit imported to the United States comes from Chile and New Zealand. Kiwifruit is available year-round. Select kiwifruit with no bruises or soft spots. Avoid fruits with wrinkles or signs of exterior damage. Buy firm kiwifruit and let them ripen at home for a juicier flavor. A kiwifruit is ripe when plump and slightly soft to the touch with a fragrant smell. Ripen kiwifruit at room temperature for 3 to 5 days. If necessary, ripe kiwifruit can be stored in the refrigerator for up to 7 days. If they need to be stored longer, put kiwis in a plastic bag in the refrigerator for up to 2 weeks. The plastic bag helps reduce moisture loss so kiwifruit stays fresh longer. Putting kiwifruit near fruits that produce ethlyene gas, such as apples, bananas or pears, will speed up the ripening process. So if you want to ripen kiwifruit quickly, put kiwi in a bag with these kinds of fruit for a day or two. You can eat the fuzzy skin on the outside of the kiwifruit. The skin is very thin and just needs to be rinsed and rubbed lightly to dry. Then, cut in quarters like an orange and enjoy-skin and all! It's easy to peel kiwifruit. First, cut off the top and bottom ends, and then peel down the sides with a vegetable peeler or knife. Slice or quarter into bite-size pieces and enjoy kiwifruit's refreshing taste. Kiwifruit can be medium or small in size, although most are small. They are brown and fuzzy on the outside and bright green on the inside with tiny black seeds. The shell or skin of the fruit can be eaten or peeled. Kiwifruit is a member of the botanical family Actinidia and there are 400 different varieties. Kiwifruit vines are trained to grow on a trellis, and vines can be as high as 15 feet. This helps plants get enough light and air for optimal fruit quality. The fruit hangs down along the sides, like table grapes. The Hayward variety is the most popular U.S. variety. The flavor is a mixture of peaches, strawberries, and melon with a soft and juicy texture. It's one of the most popular fruits today. Kiwifruit is high in antioxidant vitamin C and a good source of fiber, vitamin E and potassium. It is fat free, sodium free and cholesterol free. The lemon originated in China? Lemonade was a favorite of the Chinese Emperors? Lemons made their way to the United States with the help of Catholic Missionaries and were planted in Arizona and California? Today they produce virtually all of the lemons consumed in the United States as well as about one-third of those used throughout the world (source The Packer Produce Availability & Merchandising Guide, 1999). Lemons are valued for their many uses in flavoring the food we eat, as a garnish, and for household purposes. You may store lemons at room temperature for about two weeks. They will keep for up to six weeks in a plastic bag in the refrigerator. Use lemons as quickly as possible after cutting. There are two different types of lemons — acid and sweet. The most common acid varieties include Eurekas and Lisbons. The acidic type is grown commercially and the sweet types are grown mainly by home gardeners. The trees bloom continuously all year and can produce up to 500 or 600 lemons a year. Freeze lemon juice in ice cube trays for later use. Add a twist of lemon to the water in ice cube trays for added zip to beverages. Use juice on fruit or white vegetables to help them keep their color. Remove odors, such as fish, onion, or bleach by rubbing with fresh lemon. seconds or rolling it with your hand on the counter if it is at room temperature. Add a few drops of lemon juice to whipping cream if it doesn't stiffen. Yellow-red skin. Should yield to light pressure. Sweet aroma. Smaller ones are best. Keep at room temperature, where fruit will continue to ripen. Remove skin and pit. Work over a bowl to save the juice. Raw: salads, salsas, smoothies, and sorbets.Cooked: chutneys and relishes. here's a great recipe for using those great - "in season" mangoes!!! A great addition to any summer party, picnic, or potluck. Open cans, drain beans, mix with vegetables. Combine oil and vinegar. Mix all together. Can be served with warmed tortillas. Should yield to slight pressure at the stem end. Sweet scent. Avoid melons with a pronounced yellow color or moldy aroma that indicates overripeness. Store at room temperature for 2 to 3 days. Refrigerate after cutting. Remove seeds and skins. Best at room temperature. Good for breakfast, salads, salsas, smoothies, and sorbets. Good with salty ham. Excellent source of vitamin C. Good source of potassium. These teardrop-shaped melons should have a deep yellow skin color and no dark or moist patches. Skin is coarse and has a thick, ridged rind; flesh is creamy white to yellow. Best at room temperature. Good for breakfast, salads, salsas, smoothies, and sorbets. Excellent source of vitamin C. Good source of vitamins A and B6. Should yield to slight pressure at the stem end. Sweet scent. Skin may be solid green, green-striped or mottled with white. The flesh is crisp and extremely juicy with small, hard, black seeds throughout. Avoid melons that are very soft. Oranges supply 80 fat-free calories packed with energizing carbohydrates that fuel energy levels. 1 orange supplies a healthy dose of Vitamin C, which plays an important role in cancer prevention, healthy blood circulation & wound healing. Oranges are a good source of the crucial B-vitamin folate, which is essential in preventing birth defects & fighting heart disease. Oranges contain an array of phytochemicals, which help fight age-related diseases. Ranked No. 1 on nutrition among 5 popular fruits (apples, bananas, grapes & pears), oranges are among the healthiest items in the produce section that provide valuable health benefits. Oranges are one of Mother Nature's best super foods, packed with an unbelievable array of disease-fighting nutrients, all tucked neatly beneath the peel. Oranges, as well as other fruits, contain a water-soluble fiber called pectin. Studies show that pectin helps reduce blood cholesterol levels. This may explain why individuals who eat several servings daily of fruits, such as oranges & vegetables have a lower risk for heart disease. Studies show that pectin suppresses hunger levels up to 4 hours after eating. Oranges provide antioxidants, which help protect the skin from free-radical damage known to cause signs of aging. Oranges are loaded with disease "phyt-ing" phytochemicals. These substances, such as flavonoids, which are found in oranges, act as antioxidants & may protect against heart disease. According to a Finnish study, women w/the greatest intake of flavonoids had 1/2 the risk of dying from heart disease compared to women in the study w/the lowest intake. Two main varieties sold in the U.S.: Twentieth Century, which should be smooth, round, and green-yellow in color with a sweet, mild taste and lots of juice; and Hosui, which should be golden brown in color and very, very juicy. All varieties are crisp, firm and slightly granular in texture. Asian pears will still feel hard when ripe, so smell the fruit and choose the ones that are most aromatic. Store in paper bags in the produce bin of your refrigerator. They will last several weeks. Raw: this is one of the crunchiest, juiciest fruits you'll find, and when cut they won't brown as quickly as other pears or apples. Toss in green salads with a mild, fruity dressing or in fruit salads with berries, kiwi, apples or pears. Cooked: can also be sauteed for an unusual side dish with pork or ham. Try out some of those red juicy tomatoes this summer to get some really good tasting stuff! Healthy too! It's almost impossible to find tasty tomatoes out of season, so when they're at their seasonal best, I'm happy to serve my family this dish once a week. Alternate the tomato and mozzarella slices on a large platter. Sprinkle with the basil and drizzle with olive oil. Right before serving, sprinkle with salt and pepper. Serves 8 to 10. Fresh fruits & vegetables look so luscious & appealing, it's tempting to eat them straight out of the package. Stop yourself & make for the kitchen sink! Food safety experts say it's imperative to carefully wash all your produce before you eat it to avoid food-borne illness. Every year 76 million Americans get sick from something they ate, according to the Centers for Disease Control & Prevention in Atlanta. Fortunately, most people are only ill for a day or two, but the CDC estimates that some 352,000 people are hospitalized each year & 5,000 die. Contaminated seafood, meat & poultry are the traditional culprits, but recently a number of outbreaks have been traced to fresh fruits & vegetables that were processed under less than sanitary conditions, according to the CDC. The Center for Science in the Public Interest recently analyzed 3,500 food-poisoning outbreaks & found that contaminated produce was responsible for the greatest number of individual food-borne illnesses. "Dirty irrigation water & the use of untreated manure can help spread animal pathogens to fruits & vegetables," CSPI food safety director Caroline Smith DeWaal said. Fresh manure used to fertilize vegetables can also contaminate them, the CDC said. In addition, the use of unclean water to wash & chill fruits & vegetables after harvest can contaminate many boxes of produce. Here are some key steps experts at the CDC & the U.S. Food & Drug Administration say to take to reduce the risk of food-borne illness from fresh produce. Thoroughly rinse all your fruits & vegetables under running water before you eat them. Cut away bruised & damaged areas on fruits & vegetables because they can harbor bacteria. Thoroughly wash all fruits that require peeling or cutting, like melons, before eating because bacteria can transfer from the exterior to the flesh when the fruit is sliced. Remove & throw away the outer leaves of lettuce or cabbage before washing & eating. Don't leave sliced fruit or vegetables at room temperature for more than 2 hours because bacteria can thrive on the cut surface. Always wash your hands before & after handling fresh produce. Avoid eating sprouts because bacteria can get into the seeds before the sprouts are grown & it's nearly impossible to wash out. Once you've taken the necessary food safety precautions, settle in for a treat. Fresh fruits & vegetables taste phenomenal. They also contain an array of vitamins, minerals, fiber & important health-promoting antioxidants.